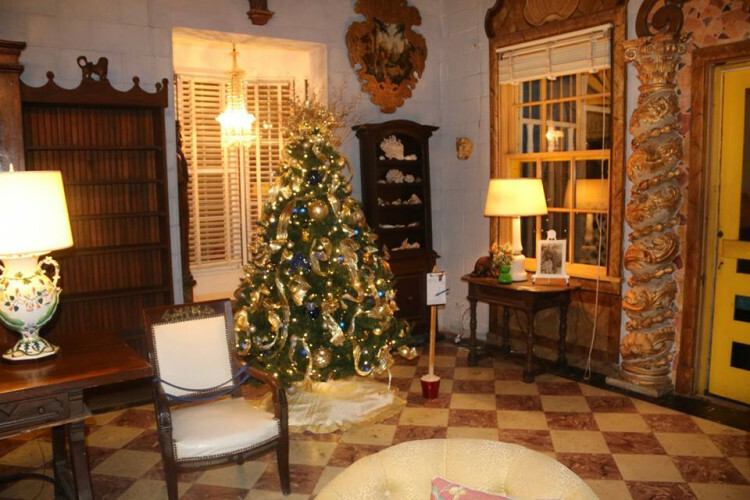 Bonnet House Museum & Gardens’ 2nd Annual Holiday Magic Weeklong Celebration kicks off Friday November 30th and lasts through December 7th with live entertainment nightly for everyone to enjoy. On November 30th we will be opening the festivities with a fully catered holiday soiree by JKV Catering and live Rockettes performance on the Veranda. In the VIP section, Kelly’s Landing Seafood will be sponsoring the seafood bar, Hard Rock Hotel is kindly donating Veuve Cliquot Champagne and ice sculptures and a live performance by electric violinist JaredViolin. The house will be lit up and lined with designer decorated trees, wreaths and centerpieces available for purchase. Santa and his elves will be roaming the estate spreading holiday cheer the entire evening. Last year this celebration was a tremendous success with a sellout crowd of 400 people. As part of Holiday Magic 2018, Bonnet House will also be open for self-guided evening tours from December 1st through the 7th with something exciting each evening for adults and kids alike. Friday, December 7:The Yuletide Carolers–Victorian costumes, harmonious voices and infectious holiday spirit. VIP Member Only Event on the Veranda: 6pm-8pm Whiskey & Dark Chocolate Tasting sponsored by Redemption Whiskey & Schakolad Chocolate Factory. Included in $15 Member Admission Rate, must have Membership Card. Become a member today and enjoy this wonderful VIP event. Admission for the kick-off party on Friday, November 30th is $60 and $100 for the VIP Reception. Admission for the night tours December 1st through the 7th from 5:30pm – 8:30pm is $15 for members and $20 for non-members, $5 for kids 6-12 and free for kids under 6. Tickets for the soiree are available online at https://www.bonnethouse.org/event/holiday-magic-soiree/. Tickets for the nightly tours are available at https://www.bonnethouse.org/event/holiday-magic-evening-experience-2/. For more information please call (954) 703-2614.